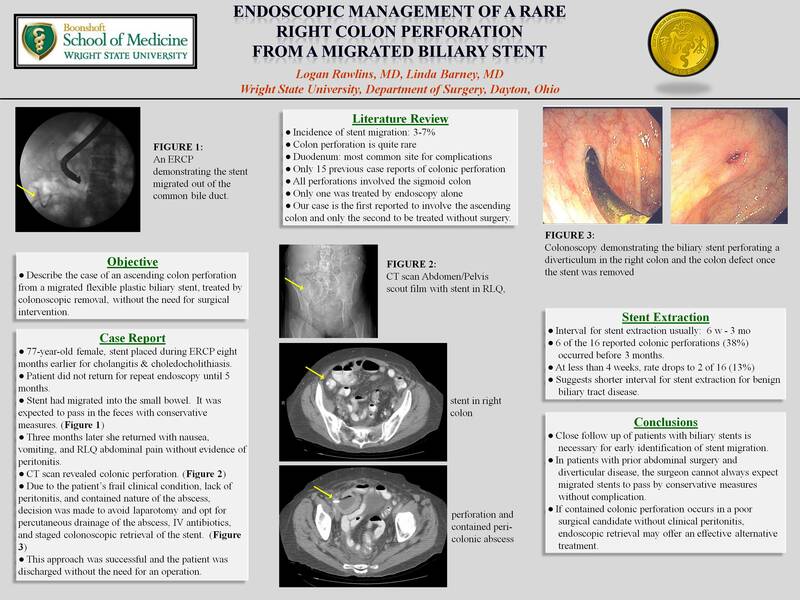 Objective: We describe the case of an ascending colon perforation from a migrated flexible biliary stent which was treated by colonoscopic removal without the need for surgical intervention. Procedure/Case Report: A 77-year-old female, with Alzheimer’s disease and multiple medical problems, presented with nausea, vomiting, and RLQ abdominal pain without evidence of peritonitis. Eight months earlier, she had undergone a laparoscopic converted to open cholecystectomy for cholecystitis with associated cholangitis and jaundice from choledocholithiasis. Preoperatively her common duct was cleared via ERCP with placement of a flexible plastic biliary stent. Despite being urged to follow up in six weeks for stent removal, the patient did not return for repeat endoscopy for 5 months. At that time, the stent was missing from the common duct and was found on imaging to have migrated distally in the small bowel or colon. The patient was sent home with the expectation that the stent would eventually pass in the feces with conservative measures (bowel stimulation, high-fiber diet). She did not return until this acute presentation. An abdominal/pelvic CT scan revealed the stent in the RLQ perforating the ascending colon with a contained peri-colonic abscess. Due to the patient’s frail clinical condition, lack of peritonitis, and contained nature of the abscess, we chose to avoid laparotomy and opted for percutaneous drainage of the abscess, IV antibiotics, and staged colonoscopic retrieval of the stent. This approach was successful and the patient was discharged without the need for an operation. Overall incidence of stent migration ranges from 3.7 to 7%. Colon perforation is quite rare. The duodenum is the most common site for migration and complications, accounting for 92% of documented perforations. In review of the literature, there are only 15 case reports of colon perforation by migrated biliary stents. All of these reports involved the sigmoid colon, and only one was treated by endoscopy alone without the need for surgery. Our case is the first reported to involve the ascending colon and only the second to be treated without surgery. The generally accepted interval for flexible plastic biliary stent extraction is anywhere from 6 weeks to 3 months. However, 6 of the 16 reported colon perforations (38%) occurred before 3 months. It is only at less than 4 weeks when that number falls to 2 of 16 (13%). This suggests consideration of a shorter interval for stent extraction when longer, more rigid, and straighter stents are placed for benign biliary tract disease. Conclusions: Close follow up of patients with biliary stents is necessary for early identification of stent migration. In patients with prior abdominal surgery and diverticular disease, we cannot always expect migrated stents to pass by conservative measures without complication. If contained colonic perforation occurs in a poor surgical candidate without clinical peritonitis, endoscopic retrieval may offer an effective alternative treatment.